The Talmud in tractate Bava Batra 3:1 relates that the Hasmonean dynasty came to a tragic end with the death of the last survivor of Herod’s purges, a young woman whose name is not given. Herod was a servant of the Hasmoneans, and there was a “little girl” among them upon whom he cast his eyes. One day he heard a voice saying that a servant who should rebel that day would succeed. Then he slew all his superiors except this little girl; and when she saw that he intended to marry her, she ascended to the roof and proclaimed: "If it happen that one shall claim himself descended from the Hasmoneans, be it known that he is a slave, for all the Hasmoneans were slain except myself, and I now commit suicide by throwing myself from this roof. Whoever says that he is from the household of the Hasmoneans is surely a slave. The Talmud is unclear as to who the “little girl” was. Some assume that she was Miriam, the daughter of Alexander and Alexandra, both of whom were descended of Alexander Jannai and Shlomit Alexandra (see genealogical chart top right). The problem with this interpretation is that (according to Josephus) the aforementioned Miriam did actually marry Herod and bore him four children: Alexander, Aristobolous, Shlomzion and Cyprus. Even after the death of the young maiden, there remained remnants of the Hasmonean house, however they were forced to go into hiding out of fear. And what the Talmud relates that nothing remained (of the Hasmonean house) means that they hid and disappeared from the public eye. God forfend to say that the seed of those who brought such great salvation to the Jewish people (the Hasomenans), became extinct. Josephus indeed writes that Herod had to contend with claimants to the Hasmonean throne well into his reign. Are Descendants of the Hasmoneans Really Slaves? The Talmudic dictum(?) that Hasmonean descent constitutes tainted ancestry apparently was never taken too seriously. How else to account for numerous families of distinction, throughout Jewish history claiming Hasmonean ancestry (although one may counter that those claims should likewise not be taken seriously, however just the fact that these devout Jews would make such a claim proves my point). The family from which I am derived is not an ignoble one, but hath descended all along from the priests; and as nobility among several people is of a different origin, so with us to be of the sacerdotal dignity, is an indication of the splendor of a family. Now, I am not only sprung from a sacerdotal family in general, but from the first of the twenty-four courses; and as among us there is not only a considerable difference between one family of each course and another, I am of the chief family of that first course also; nay, further, by my mother I am of the royal blood; for the children of Asamoneus חשמונאי from whom that family was derived, had both the office of the high priesthood, and the dignity of a king, for a long time together. I will accordingly set down my progenitors in order. My grandfather's father was named Simon, with the addition of Psellus : he lived at the same time with that son of Simon the high priest, who first of all the high priests was named Hyrcanus. This Simon Psellus had nine sons, one of whom was Matthias, called Ephlias: he married the daughter of Jonathan the high priest, which Jonathan was the first of the sons of Asamoneus, who was high priest, and was the brother of Simon the high priest also. This Matthias had a son called Matthias Curtus, and that in the first year of the government of Hyrcanus: his son's name was Joseph, born in the ninth year of the reign of Alexandra: his son Matthias was born in the tenth year of the reign of Archclaus; as was I born to Matthias in the first year of the reign of Caius Caesar. Josephus considered himself a Pharisee (the antecedents of Rabbinic Judaism). Assuming the "problem" of Hasmonean ancestry was known during the time of Josephus (the Tannaitic period), why would Josephus make such a claim? The Perahia ha-Cohen family (some link the Perahias to the Pereiras of Sephardic reknown) were a distinguished family of Rabbis and and scholars in the Balkan Peninsula (particularly in Salonika) . This family prided itself with their pedigree, and traced themselves to the aforementioned Jewish historian Flavius Josephus. The Sephardic historian Michael Molho wrote a monograph on the Perahia family under the title Essai d’une Monographie sur la Famille Pérahia à Thessalonique (Salonica, 1938) that also records this claim and mentions the founder of this branch who came to Salonika from southern Italy in 1502. This claim is also cited by the historian David Conforte in his book Kore ha‑Dorot, among others. The Goldsmids were a family of wealthy Anglo-Jewish bankers and barons. A.M. Hyamson in A History of the Jews in England records an early family tradition among the Goldsmids claiming “descent from Moses Uri haLevi (1544-1622) who had come to Emden from Poland, the first recognized Ashkenazi rabbi of Amsterdam, brought there by the earliest of the ex-Marrano settlers. But there is a far more distinguished ancestry to which the family more or less lays claim – one however which the Heralds are not as yet prepared to accept – and that is the princely Hasmonean family of Judaea and the Maccabee hero-sons of Mattathias the priest. Rabbi Uri claimed this illustrious ancestry and the Goldsmid family, inheriting the claim, took as its motto Mi Camocha Baelim Adonai, “who is like unto Thee, O Lord, among the Gods”, the basis of the name of Maccabi if an acrostic is accepted. The descendants of Rabbi Uri haLevi formed several branches, known severally as Moses, Levi, Letteris, as well as Goldsmid. ... The name Goldsmid is supposed to be a kinnui or civil name, the equivalent of Uri. According to Exodus, Bezalel ben Uri was the goldsmith employed in the decoration of the Tabernacle”. *Isaac Lyon Goldsmid was born in London and entered the family firm of Mocatta and Goldsmid bullion brokers to the Bank of England. He became a very successful financier, his estate at death being valued at over £1 million. Throughout his lifetime he used his wealth and status to advance educational, social and religious reform and to pursue Jewish political emancipation, playing a pivotal role in the founding of UCL. Goldsmid abhorred the division of the London Jews into distinct Ashkenazi (German- and Yiddish-speaking) and Sephardi (Spanish and Portuguese) communities. In an attempt to remedy this he was instrumental in founding a distinct “British” synagogue – the West London Synagogue of British Jews, opened on 27 February 1842. It is also interesting mention that when Theodore Herzl visited England in 1895, he found an instant ally in the person of a wealthy and well- connected Colonel Goldsmid who became an enthusiastic supporter of Herzl's plans. I came across an additional curious anecdote, this one about a converso family that settled in Brazil which claimed to possess a deed of nobility proving its descent from the Maccabees. A similar claim existed in the family of Joseph Salvador, an eccentric thinker of converso origin who lived in 19th century France . I would also mention a bizarre reference in Bryan Mark Rigg's book, "Hitler's Jewish Soldiers". Like most German Jews, Germany's Sephardim naively felt that Nazi persecutions were directed mainly at the hated "ostjuden" (Polish Jews, Ashkenazim) and not against the highly cultured, highly assimilated German Jew. A good example of this is cited on page 14, "Lt.Col. Albert Benary, a half-Jew and well known military writer wrote the Nazi Government: "My family doesn't come out of the eastern ghettos. They came from the west through North Africa and Spain to Germany and certainly picked up non-Jewish blood along the way. However my family is not ashamed of its Jewish blood. We can trace our Jewish blood back to the priestly caste of the Jewish people and out family's motto, battle cry if you will, comes from the Maccabees...I believe I have the right to ask not to be treated as a second class German citizen".
. Unfortunately, many people tend to confuse Josephus (whose hebrew name was Yosef Ben Matityahu) with another obscure figure Yosef ben Gurion who was his contemporary. The popular medieval work Sefer Yossifon is not the Hebrew version of Josephus History of the Jews (which Josephus-by his own account- did write but has subsequently been lost) but rather a later medieval adaptation. see here and here for a more in depth discussion on this. In the Venice edition of Yosifon, first published in 1544, there are numerous gushing approbations by leading Italian Rabbis, testifying to the saintliness of the man (whom they evidently thought was Josephus, one of the commanders of the Jewish War) , some went so far as to call him, Yosef Hacohen "Hagadol"(literally, the High Priest)!. 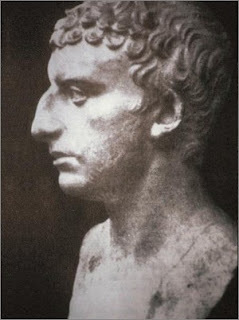 Apparently Italian Jewry took great pride in one of their own sons (after all Josephus was the first famous Italian Jew) and obviously looked at the man from a biased perpective(Ironic, since Josephus adopted the name of his patron[and the Jews' persecutor], Flavius Vespasian Caesar, the father of Titus.). As mentioned, the Perahias too were of southern Italian origin. Whether Josephus was a traitor or a wise man who tried to salvage the Jewish kingdom is a question that modern historians still argue. In 1937 a group of law students in Antwerp reopened the case of Flavius Josephus, and after a mock trial found him guilty of "treason." In 1941, in the midst of the Second World War, a group of young resistance fighters who were strong supporters of Zionism reacting as French and Jewish patriots accused Josephus of "collaboration." Today, Josephus' works are read more widely in Israel than in any other country. Archaeology, Israel's "national sport," could not do without him. I should get you to find my family lineage. and a hysteric woman proudly exclaims "she's royalty" because she is a descendant of King David, I think it's just a bad joke; just do the math, and you figure out everyone in the West is a descendant of King David. Furthermore, the lineages presented usually don't meet scientific criteria. In the excellent genealogy.medieval newsgroup, almost every "Descent from antiquity"(DFA) claim has been critically scrutinized and none matched verifiable scientific standards; at best it was a lot of hear-say, and anecdotes. Statistically we are all descendants of these people; however, penning down a solid generation-by-generation lignage is extremely difficult, if not impossible thing. To take pride in such "claims" is rather embarassing, in my humble opinion. Take for example the Flavius/Perahia claim: I am not an expert on the reception of Josephus's work, but basically his works were not widely-read until they started being printed at the end of the 15th, early 16th century. So, from the time Josephus authored his work until 1400-1500 years, his work was only available to very few people (and presumably mostly medieval monks who were able to read latin). So during this time of obscurity, the family was also aware of this claim? That seems very far-fetched. It seems much more credible to me that only at the time when the work of Josephus was popularized through print that this claim/anecdote arose. In any case, I am deeply skeptical of these claims. Thanks again for this blog entry; enjoy reading your stuff. Well, I can tell you this much already: one of your ancestors was probably a printer. I agree with your sentiment, which is why I added that caveat about not taking these claims too seriously. This belongs in the category of folklore rather than history. My basic point was that the issue of tainted descent could not have been taken seriously by the Rabbis of the Talmud or anytime thereafter. re: Josephus. He was actually known to Jewish scholars as early as the tenth century. The author of Josippon (who lived during that time period) displays an obvious familiarity with Josephus' works (including the obscure "Contra Apion"). Yeah sure. What's your blog's url?